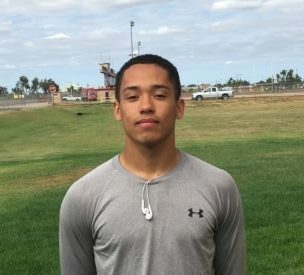 Liberal sophomore quarterback Syris Dunlap is the Mead Lumber Athlete of the Week. Dunlap rushed for 156 yards and was 8-14 passing for 79 yards in Liberal’s 40-6 win at Wichita North on Friday night. He has 54 carries for 391 yards and nine touchdowns for an average of 7.2 yards per carry for the 3-1 Redskins. He is 23-47 passing with 267 yards and two touchdowns. He rushed for 677 yards as a freshman. He also plays basketball and runs track. He will be in the fall musical at LHS. Dunlap and the Skins host the 4-0 Garden City Buffaloes Friday night at 7 on 1270 and kscbnews.net with Redskin Pre-game at 6.